The super high quality of the XtremeDoor demands a secure locking system. Every XtremeDoor is fitted with a multi-point locking system and anti-bump, anti-pick, anti-snap, and anti-drill cylinders fitted with guards. We have a selection of handle options for the operation of your XtremeDoor. The traditional lever handle option comes in a choice of five finishes: Chrome, Gold, Brushed Silver, Black and White. This handle option is used with our high security 5-hook lock mechanism. The lock has two hooks that act like a pincer to pull the door in tight and a central hook below the latch, there is also a snib function to key lock the door from the inside which, once engaged, prevents external key operation, or allows the door to be closed without the lock engaging. 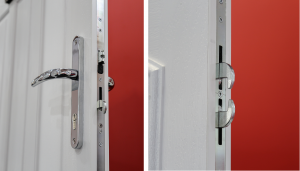 This lock is tested to Secured by Design standards and has passed the stringent PAS24 burglar simulation tests. 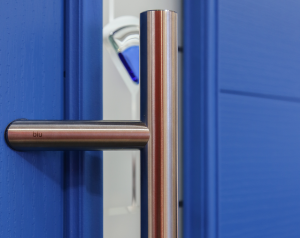 There is also the option of having a contemporary off-set long bar handle, perfect for more modern door designs. The handles are finished in a stylish Brushed Silver effect. They are manufactured in 316 Marine Grade stainless steel to ensure the ultimate durability, even in the most extreme environments. The long bar option is used with the German made AV2 auto shut lock. This lock has 2 hooks and locks which automatically pull the door in tight when closed. A thumb turn is used on the inside and your installer will be able to instruct on its operation. 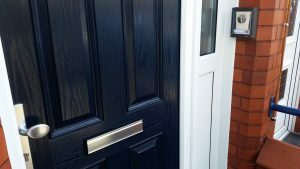 Alternatively, when you want to replicate a traditional timber door look, we have the cylinder pull option. 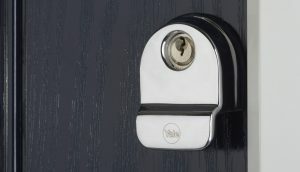 This uses a high-quality auto lock from Winkhaus and the cylinder pull is available in Brushed Silver, Chrome, or Gold. There is also an electric lock option which can be wired into existing or new intercom systems. The XtremeDoor can be used with the industry’s best automatic lock, the AV2e. This option means the hooks are retracted remotely and automatically engage again when the door closes. This lock is perfect for commercial use in flats and multi occupancy properties. It can also be used in sheltered housing, special needs, and disability housing where security is paramount.